Nearest: Tube Station: Holborn 0.2 miles (0.4 km), Railway Station: Farringdon 0.7 miles (1.1 km), DLR Station: Tower Gateway 2.2 miles (3.5 km), Motorway: M1 Junction 1 5.8 miles (9.3 km). Fantastic location for the tube system with no less than 5 The Doubletree by Hilton London West End Hotel is located midway along Southampton Row between Russell Square and Holborn. This section of central London is particularly useful for giving access into the City of London while being walking Distance From the tourist heartland of London. Just south of the hotel is High Holborn which makes up park of a straight road link into the financial areas known as the Square Mile. Russell Square is 250 yards north of the hotel. This is a major through route from north London to central, east and south London areas. Busy at all times it offers excellent transport links with a host of bus rotes running along this section as well as a tube station being located on the Square. Black Taxis are always using the route so will never bee a problem to find. Covent Garden is less than half mile to the south east of the hotel and is the start of the nightlife and theatreland. Just beyond Covent Garden is Soho and Leicester Square. Southampton Row has a few small small shops while a large shopping centre can be found just 1/3rd mile to the north at Brunswick Square called the Brunswick Centre and includes a cinema. Other local places of interest include the British Museum (0.2 miles), Sir John Soames Museum (0.3 miles), Dickens House (0.3 miles) and the London Transport Museum (0.5 miles). A contemporary hotel, the Doubletree by Hilton London West End Hotel retains its original Edwardian facade. The hotels bedrooms are well appointed and have modern contemporary style and furnishings with cool, calming tones. They are all en-suite (branded toiletries supplied) with guest controlled air-conditioning. Amenities include plasma TV with satellite channels and Pay per view movies, play station, laptop size safe, large desk, iron/ironing board, radio, direct-dial phone with voicemail, modem point, WiFi internet, hairdryer, trouser press and tea and coffee making facilities. Each room has a sweet Dreams by Doubletree Sleep Experience beds. A number of hotel suites are available with a separate living area, balcony, kitchenette, DVD player and music centre. Deluxe rooms have larger TV's. Deluxe Room Plus rooms come with bathrobe, slippers and a range of luxurious amenities. Executive Rooms have a 32-inch plasma TV. All the benefits of the deluxe rooms plus Executive Lounge access with complimentary continental breakfast and refreshments. Room service is 24 hours and includes a children's menu. Bar 92: Fully air-conditioned this is the hotels main bar. Large Screen TV shows major sports events and news channels. Fully licensed with a large range of drinks. Soft furnishings and a calm, tranquil atmosphere. Serves breakfast, lunch and pre-theatre meals. The Level Restaurant: Eclectic ambiance of this vibrant and stylish restaurant. Serves an innovative international menu. The Doubletree London West End Hotel has 12 air-conditioned meeting/function rooms and the largest, the Derby Room, can handle up to 200 guests theatre style. Each rooms has high tech facilities. WiFi internet can be picked up in all areas of the hotel. If you don't have your own laptop then in the hotel lobby you can make use of the internet kiosks which have attached printers and the 24 hour business centre (fax, photocopy etc.). The hotel also offers fax an copy services. There is a fitness room by Precor for guest use within the hotel. Open 24 hours and fitted with cardio and resistance machines and free weights. Smoking is not permitted in area. Public parking is available in close proximity to the hotel and costs £32 per day. Doubletree by Hilton Islington: is 1.0 miles (1.6 km) away, has a guest satisfaction score of 88% and rates start from about £98. Doubletree By Hilton Marble Arch: is 1.6 miles (2.5 km) from here, earns a customer rating of 78% and base rates begin at about £152. Doubletree By Hilton Westminster: 1.9 miles (3.0 km), rated at 88% and with rates from around £149. Doubletree By Hilton Tower Of London: 2.0 miles (3.2 km), rated at 89% and with rates from around £118. Compared to other London hotels: This hotel has been rated 79% by past guests. The London average is 80% and the average for 4 star hotels is 83%. Therefore this hotel is below average for its sector (star rating) . Doubletree Hotels across the chain average 81% so this hotel is slightly below the guest rating for most Doubletree hotels. Milesfaster ranking: 450th from 866 London hotels, 11th of 13 Doubletree Hotels, and 208th of 328 four star rated hotels. Another to Consider: Also close by and a similar hotel (0.1 miles, 0.1 km) would be the 4 star Mercure London Bloomsbury, whose lowest rates start at about £103 and which has an 80% guest satisfaction rating. The Mercure London Bloomsbury also offers: free WiFi. Looking for lower base rates? Then another option might be the Grange Buckingham Hotel. 0.1 miles from the Doubletree By Hilton West End (0.1 km), has scored 82% from former guests and whose lowest rates start at about £75. Why not choose a hotel with a higher customer satisfaction score? If that is what your after then the 4 Star Montague On The Gardens Hotel is potentially a good choice for you. The Montague On The Gardens Hotel is only 0.2 miles (0.3 km) away. The Montague On The Gardens Hotel has an extremely high guest rating of 98%, one of the best rated London hotels. 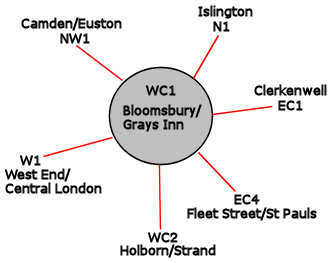 The closest fifty hotels around this area (92 Southampton Row, WC1 postcode) that are listed on this website cover a 0.6 miles (0.9 km) radius. The star rating breakdown shows 6 five star hotels (average rating 90%), 23 four star hotels (average rating 83%), 15 three star hotels (average rating 78%), 4 two star hotels (average rating 70%) and 2 one star hotels (average rating 62%). Top rated of the local hotels are Montague On The Gardens Hotel (4 star) and also the Covent Garden Hotel (5 star) (both joint top with 99%). Base Rates: Here we breakdown the starting rates (base rates) by overall average and by star rating. However base rates do not take account of special offers and one off deals so are just a guide. Looking at all the base rates of the 50 local hotels the average rate is £118 per night. Rates range from £16 at Generator Hotel (2 Star, 77%) and the highest rates top out at £363 at Rosewood London Hotel (5 Star, 98%). The following are the rate averages per star level: Five Star average: £251, Four Star average: £122, Three Star average: £84, Two Star average: £54 and One Star average: £53. Using our in-house algorithm we rank hotels based on guest ratings and weighted for related factors we rank Doubletree By Hilton West End 33rd (joint) of 50 area hotels and 19th for the 23 four star hotels in the area. We rank the hotel 42nd of 50 (20th of 23 four star hotels.) for base rates. We rank this hotel based on rates and also review scores to place it 42nd of 48 of all the closest hotels in terms of value for money (Generator Hotel was top). First opened in 1911 by Lord Strathcona. Sold to Crimson Hotels Group in November 2009 for in excess of £45 million pounds. Irishman WG Mitchell bought the hotel for around £70 million pounds in December 2007 from the Bonnington Group.